Detail, Tibetan Thangka, Collection of Losang Samten. 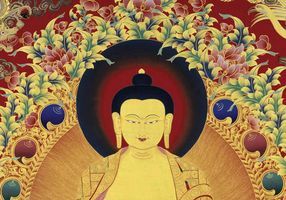 Located in the Down Jersey Folklife Center at WheatonArts, the “Old Masters: Buddhist Art and Pottery” exhibition features a variety of Buddhist artworks from the private collections of Frederick Kramer and Losang Samten. View pottery showcasing distinct ceramic styles of several Chinese periods, including Tang, Song, Yuan, Ming and Qing dynasties; Balinese pen and ink paintings; Chinese Brush paintings; sculptures of the many Buddhas, Bodhisattvas, and other deities; as well as Tibetan thangkas – Buddhist paintings on cotton with silk appliqué. Open Tuesday through Sunday from 11 a.m. to 4 p.m., April 2 through June 30, 2019.